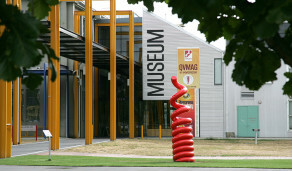 Australia’s largest regional museum, the Queen Victoria Museum and Art Gallery (QVMAG) in Launceston, Tasmania has two key sites: a Museum at Inveresk; and Art Gallery at Royal Park. CUSP will feature at the Inveresk site with a focus on ‘design’ through designers from a range of disciplines. The focus will resonate with the QVMAG on a number of levels. On a community, cultural and social level, QVMAG is very much community-based, playing a key role in displaying cultural and social histories through its exhibitions. On an architectural level, QVMAG’s two sites offer buildings of significant architectural interest. Interactivity in museums and art galleries is becoming more important, so the work designer Floyd Mueller is doing will be of great interest to an institution like QVMAG. The QVMAG also promotes and encourages sustainability. Visit the Queen Victoria Museum and Art Gallery website.